Grass Valley, Calif. February 8, 2019 – Dozens of artists are creating beautifully handcrafted bowls to fill with soup for the Hospitality House Empty Bowl benefit on Saturday, March 23, 2019. This event is a community effort to raise awareness and support for local homeless individuals in need. Every ticket sold supports guests at the shelter, and those in attendance will hear from a few guests, including their experiences with homelessness. Sharing a simple meal of soup and bread is an opportunity for the community to express its compassion for those struggling with homelessness. Attendees of the event will have a variety of soups to choose from, including vegetarian and a vegan option. Local chefs and restaurants contribute a large variety of delicious soups like Thai chicken curry, asparagus, chicken tortilla, cream of cauliflower and minestrone. Hospitality House Serves, the culinary skills training class for guests at Hospitality House, will also offer a wild mushroom soup created in the kitchen at Utah’s Place. 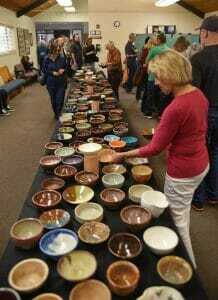 In addition to sharing a hearty bowl of soup with friends, all attendees will keep a bowl of their choosing as a reminder of those they are helping—all bowls are handmade and graciously donated. The Gold Country Woodturners are collaborating with The Curious Forge to hand-turn 75 wooden bowls, while renowned artists Dik Hotchkiss, Chic Lotz, Yvon Dokter and many other potters will donate beautiful ceramic soup bowls, plus large ceramic and wooden bowls for the silent auction. Music is also a part of the Empty Bowl experience. When attendees select their bowls, they’ll enjoy Heather MacAdam on vocals and guitar from 12 to 1:30 p.m. and music from 5 to 6:30 p.m. by Lisa Stine on harp and Margo Meredith on fiddle. This event takes place twice on March 23 with the option of attending lunch at 12 p.m. or dinner at 5 p.m. at Peace Lutheran Church, located at 828 West Main Street in Grass Valley. Tickets cost $25 and are available online at hhshelter.org, at BriarPatch Community Co-Op, at Bread & Roses Thrift & More (cash or check only at Bread & Roses), and at the door while supplies last. Children under age 12 will be admitted free but will only be eligible to receive a bowl with a paid ticket. Additional ticket options, including sponsoring a shelter guest to attend Empty Bowl, are available at hhshelter.org. Further support for Empty Bowl comes from generous local sponsors, including: BriarPatch Co-Op; Telestream; SPD Markets; Dignity Health Sierra Nevada Memorial Hospital; Nevada County Realtors Association; Peters Well Drilling; Ace Propane; Northern California Mortgage; KVMR; Peace Lutheran Church; Kathy Dotson Designs; YubaNet; and The Union.